Introducing STS Pro Score a complete race timing system. We have been developing leading edge race timing solutions for the past few years. We have recently launched our brand new Pro Score manual timing application. This has many uses in the race timing industry and we are the only company in the world to develop and distribute an application for free. This allows small clubs and events or even existing race timers to freely download and use our free application. In addition to the timing system the application also displays all of our latest news and results. Initially the application has been used for the last few years in our existing company for manual backups in addition to our electronic timing systems. We developed the new application to be freely available on all of the major mobile devices and operating systems. 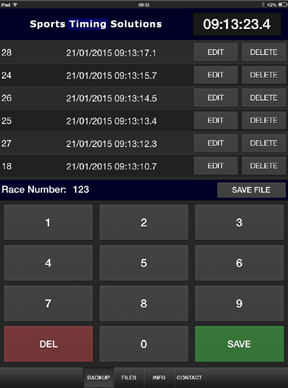 The application is part of our very own Sports Entry Solutions Race Management Platform and is essential in the timing of your events We have supplied the tools giving small events everything they need to provide professional results with a simple to use interface. Many events are now taking advantage of not only the lowest costing online entry system in the UK but now the only entry system in the world that provides the tools to time your events for free. We have the most user friendly timing system available. Welcome to STS Pro Score. The only timing application in the world that is completely free to use. A simple to use manual timing system providing all the news and latest results from Sports Timing Solutions. You are free to download and install this application by visiting the App Store. We have found the optimum size device for our app are the IPAD's. You can use this perfectly well on iphones aswell.